In addition to our several fundraising events held throughout the year, there are silent fundraising opportunities that enable parents, friends, and relatives to help our school and our children without spending any additional time or money! Below is a listing of the various ways you can support the school with this type of quick and easy fundraising! Please let us know of any others so we can add it to our list. Does your employer match charitable donations? Did you know that many employers will match your time, too? If so, please help the PTSA benefit. Simply ask your human resource department for information and fill out the proper forms. You can turn in the paperwork at a PTSA meeting or the PTSA inbox at school. If you need additional assistance, please contact our Treasurer at treasurer@fairwoodptsa.org for more information on how you can get this set up! Help us raise funds by simply shopping online at NO additional cost to you! Please ask your friends and family to use this link too to benefit our school! * Why is Tacoma listed as our city? The Amazon Smile program gets their information about eligible charities from Washington Secretary of State. The address shown on file is the address for our state PTA (WSPTA). They are our registered agent with the IRS and the Washington Secretary of State. The AmazonSmile program pulls data from the IRS filing forms and that is what is listed on our filing. You can clip Box Top coupons from hundreds of your favorite products and then turn them into your child's classroom PTSA folder. Box Tops coupons are worth 10¢ each when our school redeems them from Box Tops for Education. To learn more, visit btfe.com—and thanks for choosing to make a difference for our school with Box Tops! If you have any questions please email boxtops@fairwoodptsa.org. eScrip allows participating merchants to contribute a percentage of your grocery loyalty cards, credit card and debit/ATM card purchases to Fairwood PTSA. All you need to do is register your card purchases with eScrip and designate Fairwood PTSA as your partner organization. Enter “Fairwood Elementary School” in the group search box. Our GroupID is 901804266. Next, enter and/or update all possible Safeway, Bartell Drugs, credit and debit card information. *As of August 1, 2015 Safeway is no longer participating in the eScrip program. Help our school raise money all year long with Burgers for Better Schools™! It’s free to join and easy to participate. 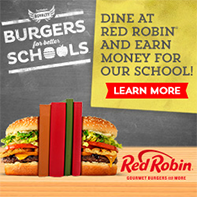 All you have to do is become a Red Robin Royalty member, select our school, and Red Robin will donate 1% of all purchases you make at participating locations. Sign up for weekly delivery. Enter “PTSA” in the promo code field. Enter “Fairwood Elementary PTSA” in the “How did you hear about us?” field. Fine print: Offer is for new customers only. Must maintain weekly service for at least 4 deliveries.